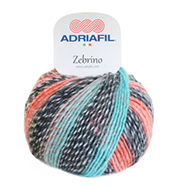 Adriafil is a traditional yarn brand from Italy, with a beautiful range of fibres and colours - there's plenty to choose from. Bucaneve is exceptionally soft and perfect for those extra special DK baby knits! We currently stock 8 colours. It's a versatile and fun yarn, perfect for socks or even your own 4ply projects. Another one of their super soft yarns that's perfect for those baby knits, or a special jumper for yourself. We currently stock 7 colours. Our favourite self patterning yarn! It really does all the hard work for, enabling those stunning garments with minimal work. We currently stock 10 colours.